The Operational Units of the Western Regional Department of SBGS informed the military personnel about the car with illegal immigrants going towards the border. Therefore, the Reaction Group “Salovka” of BU “Tysa” was immediately sent to the mentioned direction. It took just twenty minutes to find the offenders. They were detained 200 meters from the state border in the suburb of the village Esen, Uzhhorod district. One of the detainees introduced himself as Syrian, the other was found to have an expired passport of a Kuwaiti citizen. Subsequently it was succeeded to find out that illegal migrants were taken by the taxi driver from the city of Uzhhorod by car. They are delivered to the Border Unit to establish all the circumstances of the offence. 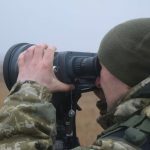 The foreigners will be held accountable under Articles 202 and 204-1 of the Administrative Infringement Code of Ukraine. The taxi driver will be responsible before the law for offence commitment under the Article 206-1 of the AICU. This entry was posted in Translated Media-News from Ukraine on October 28, 2018 by oksana.